Michael and Patrick record in the same room for the first time ever! Scratch that… They did an episode of Yo! MTG Taps together in 2010. Check that one out. Anyway, they are together at the Team Ultra PRO house up in Vancouver to prepare for Pro Tour Magic Origins… But still took the time to make this awesome podcast! Oblivion Sower is a new card hinted at by this week’s announcement of Duel Decks: Zendikar vs. Eldrazi. While it looks like a “clunky 5/8 for six” it is a creature with many important layers. 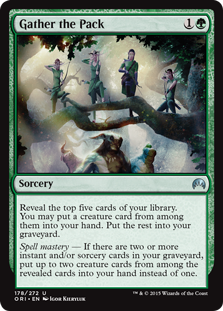 While it costs six, the “target opponent exiles the top four cards of his or her library, then you may put any number of land cards that player owns from exile onto the battlefield under your control” triggers on cast, not when Oblivion Sower enters the battlefield. That means that even if a blue player counters Oblivion Sower, you will still have the opportunity to get more lands into play. I already have six mana! Why would I want to get 1-2 more lands from the top of my opponent’s library? 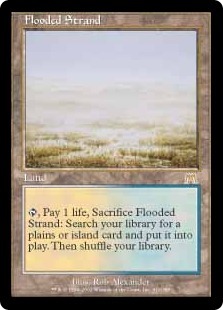 It’s not just that you can get lands off the top of your opponent’s library. You can play any lands that the opponent has in exile. That means that if the opponent is setting up with Treasure Cruise or Dig Through Time you can play any of those lands, too. But why might you want to get to 8, 10, or even 15 mana (which Oblivion Sower can help you to accomplish)? Ugin the Spirit Dragon – Oblivion Sower costs six. If you can play even one land from exile your natural land drop the following turn will get you to the eight mana you need to cast Ugin. Nissa’s Revelation – Having tons of expensive creatures in your deck will help you get paid off by playing powerhouse — but hella expensive — cards like Nissa’s Revelation. Zendikar’s Roil – Five into six into multiple triggers isn’t just a mondo combo, it flows nicely curve-wise. Emrakul, the Aeons Torn – While Patrick really, really doesn’t think that Emrakul, the Aeons Torn will be printed in Return to Zendikar, there will be some giant that is super expensive… And Oblivion Sower will help you get there. Flooded Strand had an interesting set of performances at last weekend’s Star City Games Standard Open. Flooded Strand showed up in Logan Mize’s U/W Heroic deck, Jeff Hoogland’s brand spanking new Thopter-based control deck, and (along with our recent centerpiece Jace, Telepath Unbound) a new take on Jeskai in the hands of Kevin McLeskey. Logan Mize made the finals of the Standard Open with a straight U/W Heroic deck. While a seemingly perfect metagame choice (U/W Heroic is a strong deck in a field full of slow G/R Devotion decks), Logan didn’t play any new cards from Magic Origins. This deck is an “all-in” take on U/W Heroic. Logan played four copies of Aqueous Form, and even four copies of Ordeal of Heliod! This deck wants to play a Heroic creature, slap an aura on it, and kill the opponent quickly. Jeff Hoogland played an inventive new deck that showcases multiple cards from Magic Origins and is a completely different take on one of Magic’s most time-tested archetypes. The big interaction here is around Hangarback Walker, Thopter Spy Network, and Darksteel Citadel. With either of the other kinds of artifacts in play, Thopter Spy Network can create a tremendous advantage, combining the best elements of Bitterblossom and Bident of Thassa. Hangarback Walker is itself an outstanding card, and Patrick and Michael wax quite a bit on its mana efficiency, defensive impact, and interactions with Abzan Charm. One Dragon Fodder, three Raise the Alarms, huh? While there are a couple of down sides to that split (in a deck that can make both red and white, one is an instant and one is a sorcery), Dragon Fodder and Hordeling Outburst both making goblins increases the danger posed by an opposing Bile Blight. There might be a reason behind this decision. Patrick and Michael discuss. This deck is a great showcase for our newest Jace. Jace, Vryn’s Prodigy and Ojutai’s Command make for some resilience here; plus Jace and Jeskai Ascendency are actually pretty good friends. Here’s a funny story: Michael kinda sorta didn’t know how Jace, Telepath Unbound works / worked / etc. 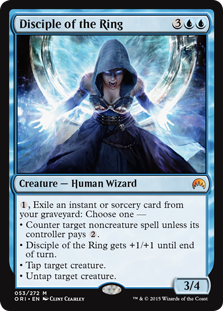 I mean if you “only” get a Snapcaster Mage you are [still] potentially playing in the big leagues in terms of card power and quality. … But what if you didn’t have to pay the mana cost on that mid-paragraph [-3]? Well you’d be flipping Jace, Vryn’s Prodigy by dumping Worst Fears or other crazily costed sorceries like Nissa’s Revelaion* and really break the costing rules of Magic: The Gathering. All-in-all Patrick isn’t sure where this one will land. 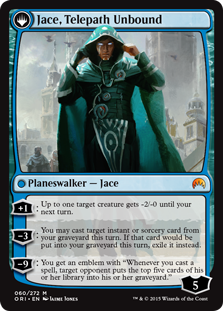 I mean: It’s a Jace. But! 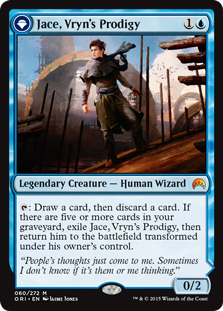 among other things, you can’t control the flip condition on pre-spark Jace, Vryn’s Prodigy. If Jace is feeling the spark… He’s going to flip. That puts different conditions on Jace, Vryn’s Prodigy than a regular Merfolk Looter. Besides which, Michael and Patrick seem to disagree about the playability of the classic Merfolk Looter anyway. You’ll just have to listen to the podcast to get the full lowdown on this one, but Patrick has an unfettered Disciple of the Ring rated as an Opposition; an Elesh Norn, Grand Cenobite; and an Iona, Shield of Emeria all wrapped up into a single Aetherling. 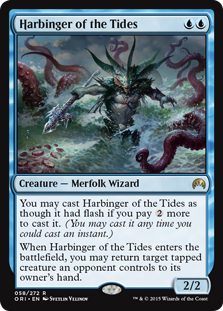 Both our intrepid podcasters seem to like Harbinger of the Tides best among the Magic Origins blue cards, ultimately. Archangel of Tithes or Kytheon, Hero of Akros? Nissa, Vastwood Seer v. Dwynen’s Elite? 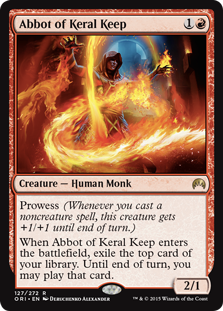 Okay, maybe three of the five; Abbot of Kerl Keep is the whiz-bang winner in red + probably the best card in Magic Origins overall! * For those wondering last week, yes of course we know Nissa’s Revelation lets you draw cards! It is still hard to use in the current environment, but pending new Eldrazi might become an All-Star in the future. For now, green decks will probably use it to find Dragonlord Atarka… Though we’re still not too keen on it. Where do you Rank Evolutionary Leap? Where do you rank Evolutionary Leap? No, Evolutionary Leap is not better than “a certain banned card in Legacy” but it’s a Birthing Pod you don’t have to tap, and has quite a few ways of generating upside. For instance, try sacrificing a Deathmist Raptor! 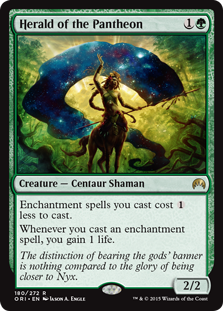 Evolutionary Leap beats removal — as long as you have enough mana, you can keep going and not run out of creatures. Evolutionary Leap is deadly against control! Control probably has to have cards like Perilous Vault to keep from falling too far behind. Evolutionary Leap is excellent with 187 creatures! You can get enters the battlefield triggers over and over. 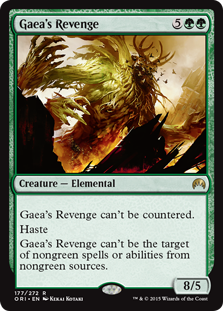 Oddly enough, Gaea’s Revenge can be killed by commonly played point removal now. Which card(s) can target this almost-hexproof threat? Is this just a Commune With the Gods that can’t find enchantments, or is there some secret to triggering its Spell Mastery upside? 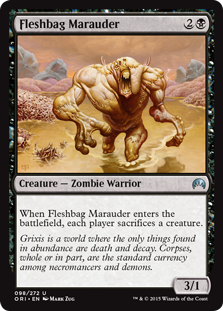 You can Can CAN play eight Fleshbag Marauders in Standard right now. You just probably shouldn’t. Patrick thinks Herald of the Pantheon looks like Andrew Cuneo. Mike says there is no way Andrew Cuneo has a greeen mana symbol anywhere near his top-right corner. There are many, many types of decks Herald of the Pantheon can go into… Mike and Patrick discuss several of them. … Would patrick run Valeron Wardens in his Undercity Troll deck? 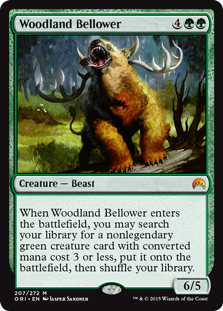 When Woodland Bellower enters the battlefield, you may search your library for a nonlegendary green creature card with converted mana cost 3 or less, put it onto the battlefield, and shuffle your library. Deathmist Raptor has implied value of greater than three mana… Having [potentially eight] Deathmist Raptors is a powerful deck building feature. The same is true of Courser of Kruphix and other standout creatures in Standard. Woodland Bellower allows you to play both as a toolbox or just a powerful threat on rate. 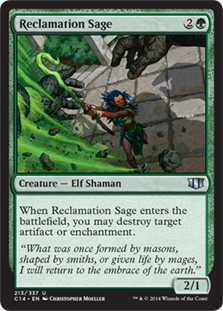 Finding Reclamation Sage allows Woodland Bellower to play as a giant Disenchant for versatility and card advantage. 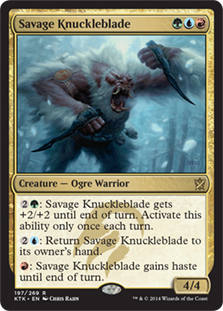 Finding Savage Knuckleblade (an additional 4/4 body in addition to its base size) puts Woodland Bellower on the order of Armada Wurm. 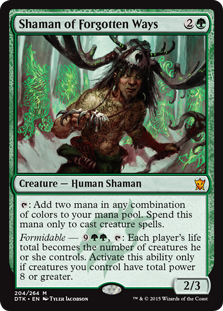 Besides setting up a potential Biorhythm kill, Woodland Bellower has sufficient power to “turn on” the Formidable on Shaman of Forgotten Ways… All by itself. Woodland Bellower seems to be making Control’s life difficult in Standard. Not only can you buy resilience (like with Deathmist Raptor) just spreading value across multiple bodies makes point removal less effective. … How do you get “one step ahead” in Magic in general? How can Woodland Bellower make a break in Modern? Patrick and Michael finish off the podcast with a spirited discussion of Demonic Pact. What do you do with a Warleader’s Helix / Divination / Mind Rot… That might kill you? What kind of deck does this fit into best? What is the “sickest” combo with Demonic Pact? Find out in “Woodland Bellower and Demonic Pact” now!